Earlier on Skype are built-in games, in which you can play with your friends. In modern versions of the program, this option is not available. However, there is another way to play through Skype. Online service GameXN Go has developed a program Game Organizer, which is compatible with Skype and contains many single (Mahjong, Sudoku and more.) 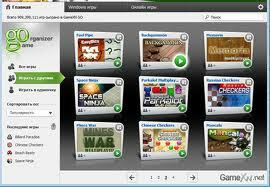 and multiplayer games, mainly, desktop (sea ​​fight, domino, checkers, chess, a variety of card games, etc.). The program can be downloaded from the website gamexn.com. Free trial, so downloading and installing problems should arise. The first thing to Allow a program through Skype. To do this, when running on Skype you need to run the program. In Skype will be the question of the confirmation dialog box. We reaffirm. Then you can invite people from your contact list to the game. Of course, interlocutor for this must also be installed Game Organizer. If the program is a person, with whom you want to play, not installed, then it can send the invitation. Your friend will link to download the program.